Newsletters - FL Studio Just Went MOBILE! We are excited to announce FL Studio Mobile (iPod Touch & iPhone) and FL Studio Mobile HD (iPad 1 & 2) is available from the App Store. 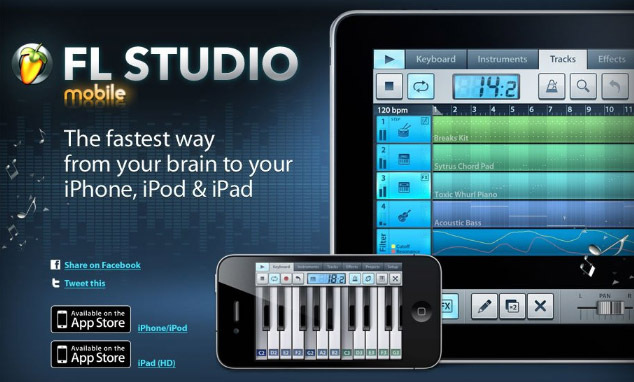 Click the image above to learn more and see videos of FL Studio Mobile in action. What's more, you can load FL Studio Mobile projects in FL Studio and take them to the next level. All you need to do is blog our News Item (link no longer available) on your Facebook Page, Website or where ever you post stuff, with a link to our News Item AND report it to this Looptalk thread or on Facebook (links no longer available) .